As I have been chiming about over and over again - fine dining and young children are not necessarily a good mix. Sure, this is highly dependent on the individual children and different restaurants. However, as a rule, most fine dining establishments are not exactly kid-friendly. So how do we get around this problem? What if a family wants to go for some unique eats other than the usual chain restaurants such as Red Robin or Boston Pizza? And with some of the prices creeping up at these chains, it's almost makes sense to eat something better. Well, other than the odd fine dining establishment that embraces families, the venerable hotel restaurant fits the bill. Of course by virtue of this, some compromises must be made. Often, hotel dining does not equate to creativity nor exciting eats. There are exceptions; but really, they have no choice. Think about it. A hotel caters to many different people differing in age, nationality and preferences. 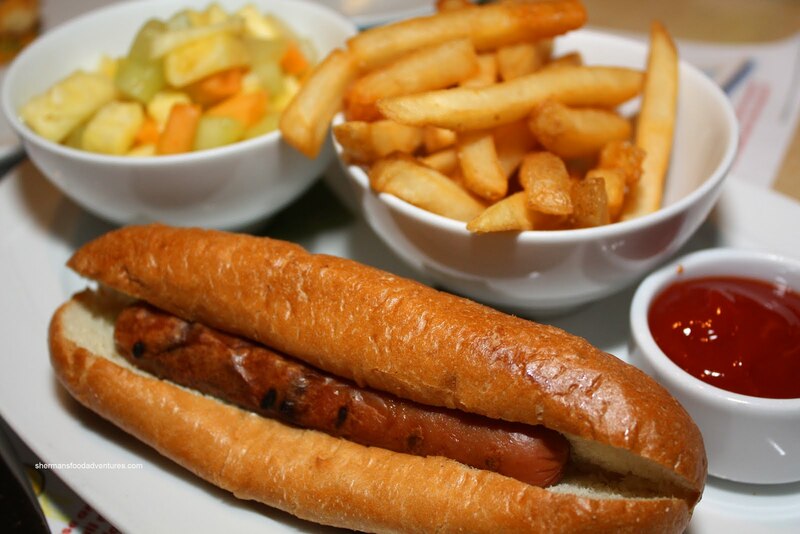 Consequently, hotel food needs to be somewhat neutral and safe. With that being said, hotel restaurants also means kid's menus. At the very least, kids are welcomed at these places. So that was the issue I was facing when picking a place to celebrate my dad's birthday. Where could we go as a family? We finally settled on Showcase in the Marriott Pinnacle in Downtown. More of a "near" fine dining establishment than anything else, Showcase fit the bill for the family. In fact, they sat us in a corner at a round table away from everyone. Perfect in my books. The kids can be kids and I can use my flash without worry. Now, one look at the menu and it is obvious that Showcase is a mesh between fine and casual dining. Case in point, of our 3 appetizers, only the Crab Cakes could be considered fine dining ma terial. 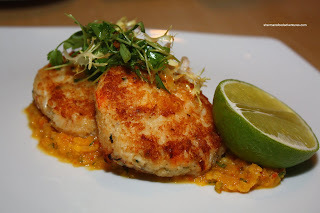 And those crab cakes were pretty good. Soft and fluffy on the inside with a crisp coating, these were naturally sweet. The corn and cilantro relish underneath only added another level of sweetness. I liked how there was only a conservative amount of cilantro used; but the dish probably needed some more savouriness. 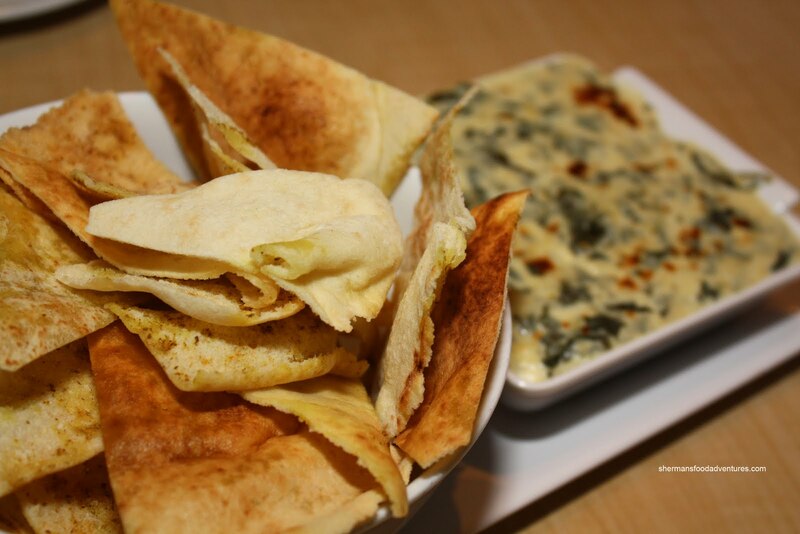 For our second appetizer, we got the Artichoke Dip with pita chips. The pita chips were fantastic. Thin and crispy, these went well with the cream chees e dip. The dip itself was very cheesy and garlicky. 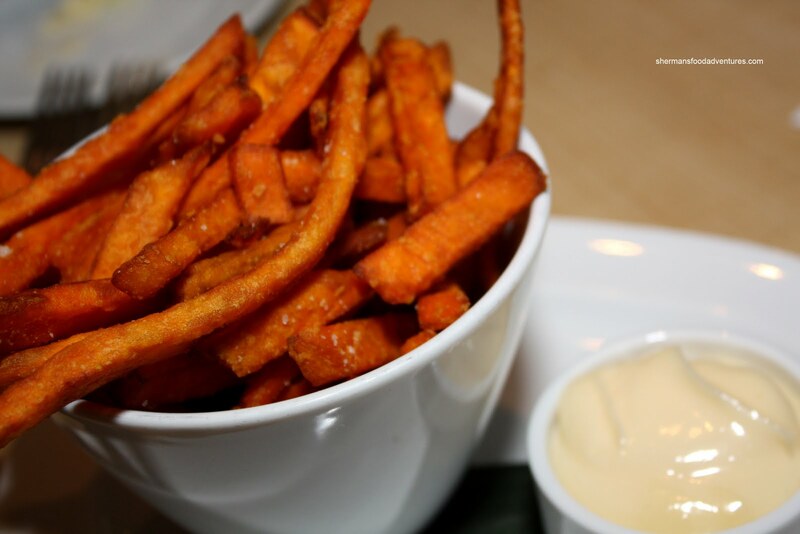 To further exemplify the non-fine diningness of Show Case, we ordered the Yam Fries with garlic mayo. Hey, this is a simple appy, but the fries were crisp to the very last piece. My dad and Viv ended up ordering the same 2-course meal. The horror! Duplicates! 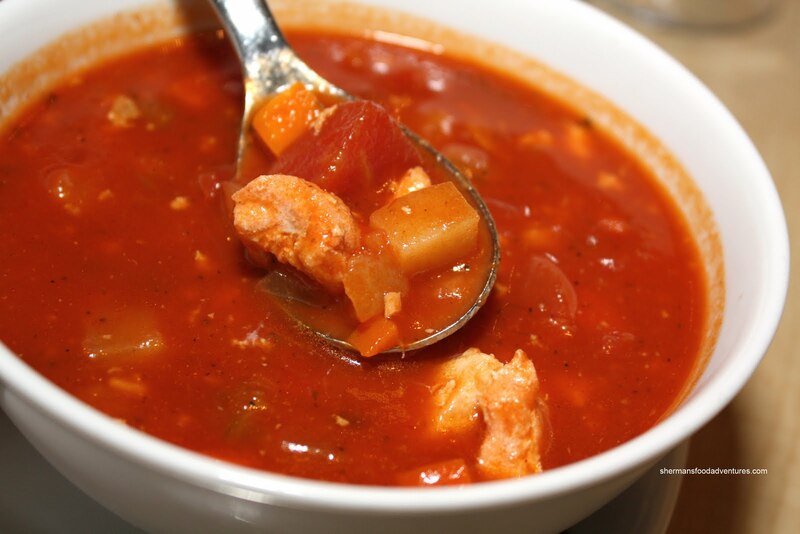 Anyways, they started with the Seafood Chowder and it was terrible. Yes, there was plenty of seafood and fresh tomatoes. Moreover, the bowl was really large. But it was as if they poured a vat of vinegar into it. So tart, it could be considered sour. We really should have sent it back. 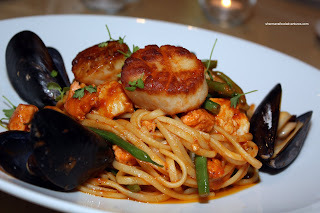 Fortunately, their main course, which was Seafood Linguine, was much better. Well- executed seafood atop al dente pasta in a slightly spicy tomato sauce. Viv remarked that everything seemed right about this dish; yet at the same time it was nothing special. I tried it myself and yah it was not bad for a non-Italian restaurant. For myself I went for something light due to the many appetizers we had ordered. When the Seared Black Cod arrived, it was indeed very light. 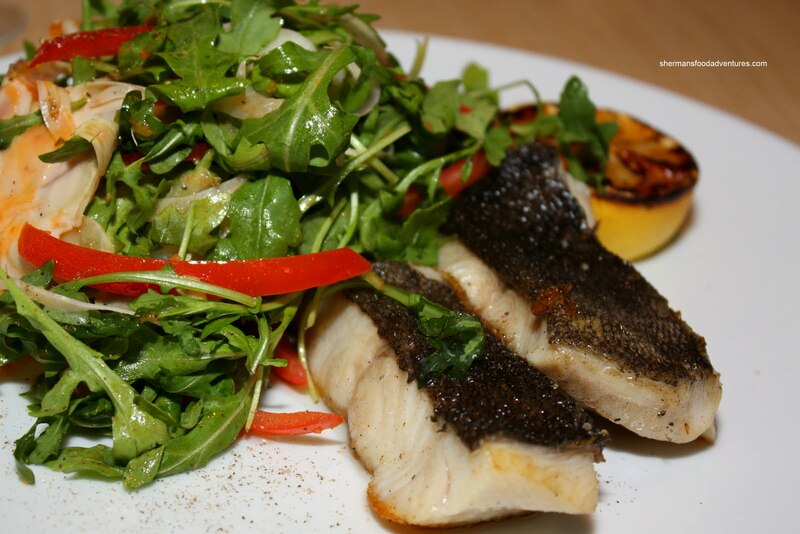 2 small pieces of cod was accompanied by an arugula and fennel salad with tomato oregano dressing. On the side was a grilled lemon which went well with the cod. The fish was prepared nicely being flaky and moist while the salad was a nice mix of flavours (bitterness from the arugula, licorice from the fennel and tartness/sweetness from the dressing). My mom ended up with something heavy in the Rib Eye with black pepper Hollandaise, mushrooms and roast tomato. She couldn't finish it so I basically filled the void left from the cod with the steak. She asked for it to be prepared medium-rare and it was indeed so. However, for some reason or another, the steak was not tender. I do realize that a rib eye is not normally as tender as a NY striploin; but this was bordering on tough. Very strange since the meat was well-marbled. Bad batch? The dish ended up to be quite saucy, maybe too much sauce. The Hollandaise was quite good; however, it was almost overwhelmed by the sweet demi-glace. At least I think it was demi-glace since it was resembling something like teriyaki. 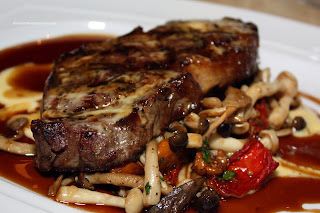 Loved the mushrooms though, added a nice flavour into each bite of steak. Now for the real reason we chose this place - the kiddies! It's nice to have an actual kid's menu available. For my daughter, she had the Hot Dog with fries and fruit salad. For $7.99, there was quite a lot of food. Lots of crispy fries and fresh fruit salad (cut up into smaller bits for the kiddies). The hot dog was... well a hot dog. At least the bun was toasted. 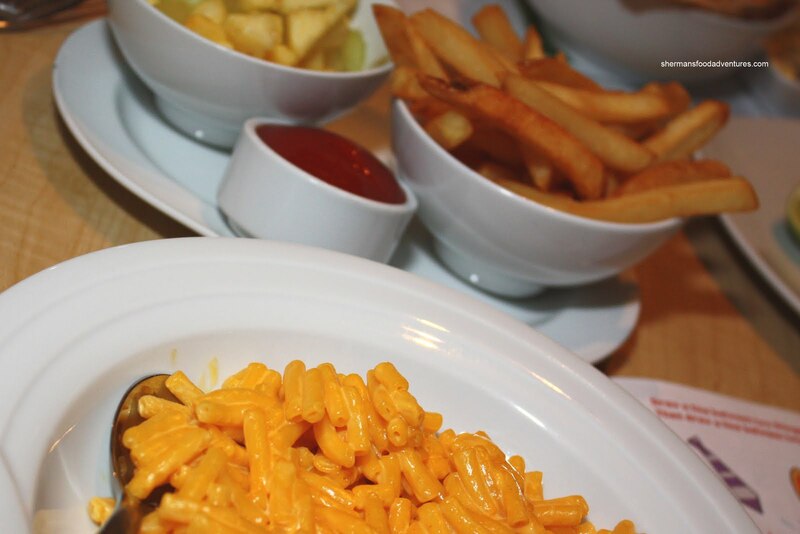 My son went for his favourite - Mac 'n Cheese with the same fries and fruit salad. Not much to comment on the mac 'n cheese really. It was alright for kids; but I personally wouldn't eat it. But for a hotel restaurant of this class, the amount of food for the price is quite fair (for the kid's meals). And once again, that is the main reason we came here. Our entire family including the kids could go out for a meal that doesn't involve Red Robin or White Spot. However, the food here at Show Case is average at best. For the items we tried, they were all edible; but not worth the price point. 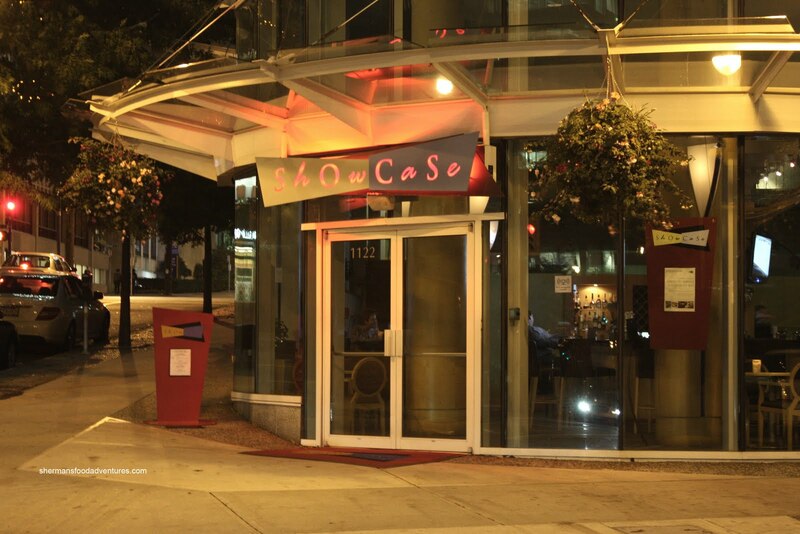 With that being said, Show Case is already one of the more "affordable" hotel restaurants in Downtown. In fact, with some of the menu options, Show Case tends to lean more towards casual dining rather than fine dining. Despite this, there are better eats in this price range nearby.